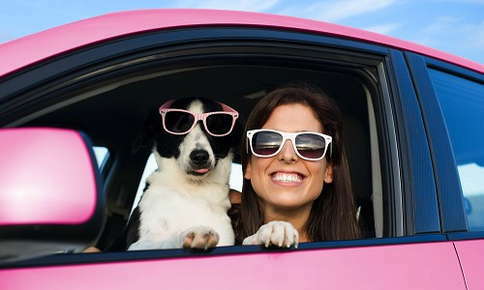 Pets are spending more time on the road or in the air these days. In fact, close to 95 percent of pet owners planned to take their pets on overnight trips in 2018, according to a Go Pet Friendly survey. Although vacations are always more fun when your pet comes along, traveling does require more planning when your dog, cat or small animal accompanies you. Following a few of these tips just might make travel more pleasant for you and your pets. Your pet may prefer to roam free in your car, but that isn't the best option if you want to reach your destination without any unfortunate incidents. Unrestrained animals can be seriously injured in even minor accidents and can pose a hazard to drivers. If you spend more time paying attention to your dog or cat's antics instead of watching the road, you may not notice that the car in front of you stopped suddenly. Harnesses, pet seatbelts, and car seats keep your dog safe, yet make it easy to view the scenery outside the window. Carriers are usually the best option for cats and small animals. Make sure you secure the handle or strap of the carrier to the seat belt to stabilize the carrier. Exploding airbags may save your life in an accident, but they can be deadly to pets. For safety's sake, the back seat is the best location for your pets. If you'll be flying, check with the airline before you purchase a carrier or crate. Each airline may have its own requirements regarding size and type. You can certainly buy food, water, and litter on the road, but it may make the trip easier if you bring these supplies from home. If you're traveling to an out-of-the-way town for a romantic getaway, it may not be easy to find your pet's preferred food brand in local stores. Unfortunately, introducing new food suddenly can lead to an upset stomach and diarrhea, which, needless to say, can certainly kill the romance. Several manufacturers offer collapsible food and water bowls and litter boxes that take up less space in your luggage. You'll also want to add a temporary tag that lists your cell phone number and your permanent and temporary addresses to your pet's collar. Microchipping your pets increases the likelihood that they'll be reunited with you if they become lost, but only if your contact information is up-to-date. If you've moved in the past few years, verify that the microchipping registry has the correct contact information. You'll probably need to stop every few hours when traveling with dogs and cats. Use a collar and lead or a harness and lead to prevent your pet from taking off the moment you open the car door. Breaks provide your pet time for restroom and water breaks. Plus, they give humans and pets alike the opportunity to stretch tired muscles. Unless the establishments are pet-friendly, you won't be able to enjoy a meal at a sit-down restaurant or take in a local attraction on your drive to your destination. Leaving your pet alone in the car alone is never a good idea. During the winter or summer, temperatures can quickly plunge or increase in a closed car, leading to a life-threatening situation for your pet. In fact, the temperature of your car can rise 20 degrees in just 10 minutes, even with the windows cracked, according to the American Veterinary Medicine Association. So, this should never be an option. Pets can experience motion sickness too. Don't feed your pet four to six hours before your trip to reduce the chance of vomiting or diarrhea. If your dog or cat has been carsick in the past, ask the veterinarian if it's safe to offer anti-nausea medication. Do you have concerns about your pet's travel readiness, or does your furry friend need immunizations or a health certificate to comply with airline regulations? Give us a call and let us know how we can help. This is Parker, he had surgery at 11 years old. No lameness after the surgery, and was almost 14 years old at time of picture.